Remember when your mum used to tell you "just because it's popular does not mean it's good" in high school? Well, I'm going to say it again - but I'm not talking about the popular crowd and all their naughty ways....I'm talking about Hunan Manor in Columbia. It is crowded, it seems very popular, it is NOT good. OK, so I went with a group of about 15 and most of us thought our meal was just OK and sat there in confusion as to why this large restaurant was quite full. We felt like there may have been a secret menu we were not privvy to! Dan and I chose to split our meals so we could share - General Tso's chicken and the House Pan Fried Noodles. I took a couple of bites of the General Tso's chicken and immediately wanted nothing to do with it - there were too many of the overly crispy bits and not enough chicken, plus the sauce wasn't tasty. 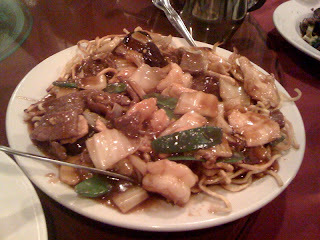 The House Pan Fried Noodles weren't delicious either. The mushrooms were too chewy and the beef was too soft. You know what I'm talking about - it was really similar to the kind of beef you get in Lean Cuisines where the ingredient list says its "Beef Product." Beef is not naturally that soft. That being said, my vegetarian friends were greatly satisfied with their meals, and so I decided to try theirs, most notably the Meatless Sweet and Sour dish. 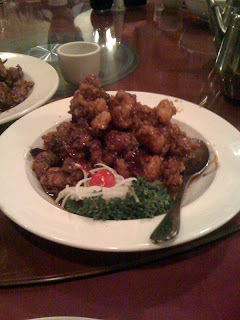 I had to agree it was MUCH better than any of the other dishes - the meatless stuff was so fried and covered in sauce you could hardly tell you weren't eating chicken. And in general it was pretty tasty. Overall, I did not have a great meal and I will not be going back.....but I can tell that a lot of people do - someone please tell me what I am missing. Are there secret dishes we should have ordered? It can't have been the duck because someone from my party ate that and he said it was just OK. It probably wasn't a lamb dish because I tried that and didn't like it either. Oh well.... perhaps everyone's just ordering the vegetarian dishes! p.s. I am hosting a $25 Gift certificate giveaway to McCormick and Schmick's. Check out the details here. I definitely think the vegetarian dishes are the reason to come to this place. If you are a meat eater, probably nothing amazing, but truly great selection/quality of non-meats (the fake kind that taste delicious). Yum! Actually, I find that beef in most Chinese restaurants is meltingly soft. It comes from the way they prepare it, with a corn starch marinade and quick cooking. If you have to chew it, it's too tough! And the vegetarian wheat meat dishes are definitely the reason to go to Hunan Manor, although some of them are so sweet as to be a good substitute for dessert. World of Eats - I mean, I'm glad the duck and chicken feet are good....but I would never order that so I would hope that their other dishes be just as delicious! You should do a review on that place though - I would be interested to see what you order. Wait... are you sure World of Eats was serious? I thought he was exercising his internet rights to scathing satire. 1 in 100 people would go to that restaurant for chicken/duck feet, so who cares if it's good when 99% of the people aren't going to EVER eat that. That's like reviewing a hot sauce and bean burrito at Chipotle. Yeah, it might be a good version of the world's WORST type of burrito, but who cares? Jamey - I was def serious. I would probably hate the Americanized Chinese dishes at Hunan as well. That is something you can get at any corner takeout place. The reason I have gone to this restaurant so many times is because it actually has a menu of authentic Chinese dishes. I first ate at HM in Nov 2003. It was EXCELLENT. My 2004 meals there were likewise memorable. Starting in 2005, things just seemed to go downhill. The ambiance is nice, the ginormous salt-water aquarium is fantastic (if you can get them to turn the lights on in the tank). BUT - the last time I took my family there (all 3 of us, two under age 6) in April 2009, was... well... the last time. For $35 for a Sunday lunch... we did not enjoy our meal, and took nothing home. The local Chinese take-out joint serves much better food, and for special meals, there's Grace Garden in Odenton. No, it hasn't the same ambiance, but every meal is memorable!! Actually, Hunan Manor does have a secret menu that you were not privy to. Most of the stuff on the menu they give to non-Asians I wouldn't touch with a stick. I was there in 2008 and was treated to a meal by the owners. It was off the "chinese" menu that is not given usually to most people unless you know to ask. It was the best meal ever since it was not the usual sweet & sour chicken type stuff you usually see at Chinese restaurants. Well since I now know there is a secret menu (though I still don't understand why it's secret if it's much better!!! ), what items should people order from there? I love their food, but it annoys me that they have a secret menu. What is the point of that?!? I know...my popular crowd comment seems a bit fitting all of a sudden! thats just my two cents, but i rather go to a place with fresher food and a place where the customer is actually right.